Movie review of the third X-Men movie X-Men The Last Stand. A movie that pales in comparison to the first two films, that suffers from a variety of shortcomings. My mother always told me that if I can’t say anything nice, I shouldn’t say anything at all. That makes writing this review difficult since the film was such a major disappointment for me. However, in deference to Mom, there were some positive points to the film as well. For example, Kelsey Grammer exceeded my expectations as Hank McCoy. I am a fan of Kelsey Grammer’s work, and fully expected him to verbally fit the character like a glove. Henry McCoy is a genius, and extremely verbose as well. But I didn’t think that Kelsey Grammer could physically fill the bill. McCoy is as acrobatic as an Olympic gymnast and has a build like a cross between a professional weightlifter and a blue gorilla. But I was very pleasantly surprised. Kelsey Grammer did it, and did it well, and was one of the highlights of the film for me. In fact, all of the actors did a first-rate job, and I have no complaint with any of their performances. However, they can only follow the script and direction that they’re given, and that’s where the movie fell apart. Part of the problem deals with the inconsistencies with the characters from the previous movies. For example, at the end of the second movie, Professor X (played wonderfully by Patrick Steward) realizes that Jean Grey (played very well by Famke Janssen) has survived, and smiles at the prospect. Here, he is terrified by the idea. The producer, director, and writer take enormous liberties with the established characters. Most especially with Jean Grey, but also with Professor X, Scott Summers (played excellently by James Marsden), and others. The movie begins with a flashback 20 years in the past, where we see Magneto (Ian McKellen) and Professor X walking (apparently before the accident that crippled Professor X) into the home of a very young Jean Grey. She demonstrates unbelievable telekinetic ability. The movie “reveals” that Professor X effectively created a split personality in Jean Grey. The ‘normal’ personality that we’ve seen in the previous movies, and ‘Phoenix’. She’s a wild, uncontrollable personality that controls far more telekinetic ability than ‘normal’ Jean. It’s this ‘Phoenix’ personality that enabled Jean to survive the end of the second movie. Likewise, it’s this same personality that murders her boyfriend/fiancee Scott Summers early in the film. The mourning Scott Summers has become utterly depressed after the ‘death’ of Jean and totally worthless to the team. Again totally out of character from the first two movies. Likewise, later on, she murders Professor X telekinetically. Even though he demonstrates that he’s no threat to her level of power. Totally out of character for Jean. And, Wolverine (Hugh Jackman) is forced to make a terrible decision. Strangely, that’s the only part that’s in character. In a nutshell, that’s the main problem with the movie. If there had been no previous movies, it wouldn’t matter as much. X-Men: The Last Stand would have been a typical mindless summer action film. But the bar had been set higher than that by the previous two films, and is a major disappointment because of that. 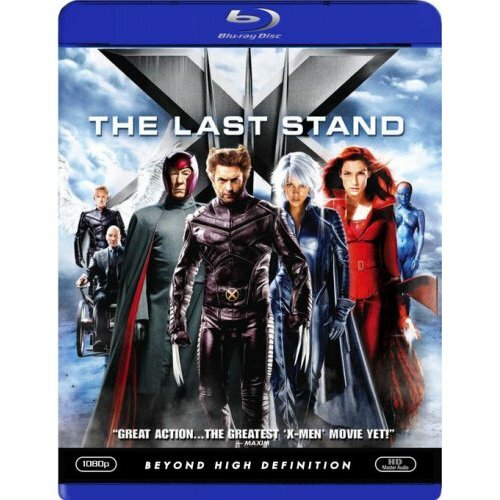 X-Men: The Last Stand is the third installment in the popular superhero franchise, and it’s an exciting one with a splash of fresh new characters. When a scientist namedWarren Worthington II announces a — cure —  for mutant powers, it raises an interesting philosophical question: is mutant power a disease that needs a cure, or is it a benefit that homo superior enjoys over — normal —  human beings? No surprise that Magneto (Ian McKellen) and his Brotherhood of Evil Mutants resist the idea that they need to be cured, and declare war on the human race. But it’s a little tougher for the X-Men, led by Professor X (Patrick Stewart), Cyclops (James Marsden), and Storm(Halle Berry). If you’re Rogue (Anna Paquin), for example, your power means you can’t even touch your boyfriend, Iceman (Shawn Ashmore). To compound matters, someone previously thought dead has returned, and might be either friend or foe.